port of south louisiana 171 Belle Terre Blvd., P.O. Box 909 LaPlace, LA 70069-0909 www.portsl.com Phone: (985) 652-9278 | Fax: (504) 568-6270 globalplex intermodal terminal Phone: (985) 652-9278 port of south louisiana executive regional airport Phone: (985) 652-9278 ext 8512 a s s o c i at e d t e r m i n a l s Phone: (985) 233-8545 The Port of South Louisiana is a member of the Ports Association of Louisiana. To become an associate member of PAL and to help further the maritime industry in Louisiana, please visit PAL’s website at www.portsoflouisiana.org or call the PAL office at (225) 334-9040. To advertise call Shelby Harper at (504) 830-7246 or email Shelby@myneworleans.com. 110 Veterans Memorial Blvd., Ste. 123, Metairie, LA 70005 (504) 828-1380 • www.myneworleans.com Copyright 2019 The Port Log, Port of South Louisiana, and Renaissance Publishing LLC. POSTMASTER: Send address changes to Port of South Louisiana, Post Office Box 909, LaPlace, LA 700690909. No part of this publication may be reproduced without the consent of the owner or Publisher. 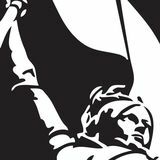 The opinions expressed in this publication are those of the authors and do not necessarily reflect the view of the magazine’s managers, owners or publisher. The Port Log is not responsible for unsolicited manuscripts, photos and artwork even if accompanied by a self addressed stamped envelope. St. John and St. James tri-parish regions. The Port is charged with a mission to promote maritime commerce, trade and development, and to establish public and private partnerships for the creation of intermodal terminals and industrial facilities. The Port’s philosophy of development is to entice companies to set up regional operations within its boundaries. The Port serves primarily as a “landlord” port to more than 30 grain, petroleum and chemical companies. The exception to this is the port-owned world-class intermodal Globalplex facility SoLaPort, and the St. James Westbank property. Within the Port’s jurisdiction, there are seven grain elevators, multiple midstreaming operations, more than 40 liquid and dry-bulk terminals, the Globalplex Intermodal Terminal and the Port’s Executive Regional Airport. The Port is under the jurisdiction of the state of Louisiana and authorized by the state constitution. A nine-member board of commissioners directs the Port; all of them are unsalaried. The ports of South Louisiana, New Orleans, Baton Rouge, St. Bernard and Plaquemines make up the world’s largest continuous port district. They are responsible for moving one-fifth of all U.S. foreign waterborne commerce. After an extensive internal cultural audit, the River Parishes To u r i s t C o m m i s s i o n ’s n e w m a r k e t i n g e f f o r t t o u t s t h e a r e a a s a destination, not just a day trip. 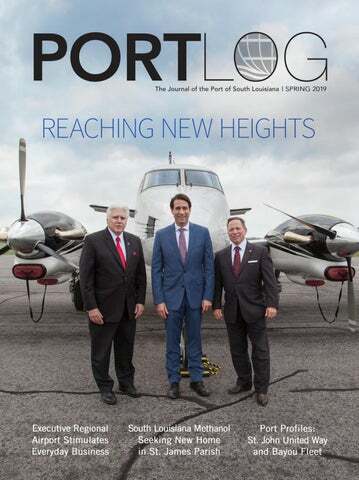 Recent reports once again quantify the impact of the Foreign Trade Zone within the Port of South Louisiana and showcase the strategic roles they play in international business. siana — where materials entering are exempt from paying duty tax, permitting them to store them free of tariff charges or manufacture/refine those materials into a finished commodity that can then be exported without taxes or duties. When used effectively, Foreign Trade Zones allow companies to increase profit margins and improve their logistics efficiency. In February 2019, a new study conducted by the Trade Partnership provided quantitative and qualitative data on the economic effects of FTZs on the communities in which the zones operate. Scan the code with your smart phone to read the full report. St. James Parish welcomes a new $2.2 billion methanol complex. Ba y ou Fl ee t o ff e r s a m o d e r n - d ay fle e t in g , ve sse l re p air an d cleani ng fa c ilit y.
truck ramp for direct vessel access. For the company, it all comes down to convenience — a word that is seldom used in the river barge industry. A major part of that convenience comes down to its 24/7 crew services, which include vessel access at any river stage with a safe and secure dock barge, a crew lounge (that doubles as an area where training and safety meetings can take place), potable water access, crane service (a knuckle boom for small lifts and a 30-ton crane at the wash dock), free garbage disposal, mail drop (including UPS and FedEx) and pollution response (including routine and emergency spill supplies). At the wash dock, Bayou Fleet can clean barges that transport coal, rock, concentrates or grain. And at the full-service yard, contractors can off-load aggregate material in an area that is easily accessible to all major highways in the river region. Joint recruitment efforts by the Port of South Louisiana and state agencies like Louisiana Economic Development have resulted in numerous new businesses setting up operations a l o n g t h e M i s s i s s i p p i R i v e r, a n d h i g h - p a y i n g j o b s f o r t h e skilled workforce of the region. Kongsberg Maritime	St. Charles $ 15M 20	NORWAY	office &training Denka Performance	St. John Elastomers HQ U.S.
O f fering high speed, low cos t s and profes sional ser vice, the E xecutive Regional Air por t is bringing in busines s and helping the River Parishes grow. The Port attends the annual NBAA schedulers and dispatchers conference to promote the Executive Regional Airport. Vincent Caire, Airport Director, and Lisa Braud, Port Manager, are pictured. Congressman Garret Graves (center) visits the Port’s Executive Regional Airport. Pictured with Executive Director Paul Aucoin (left) and Commission President Paul Robichaux (right). River Parish Community College and Ascension Parish High School Principals & Administrators learn about Port operations. Deputy Director Roy Quezaire and Marine Operations Director Brian Cox led the presentation. Port employee Nyler Williams (far left) was also in attendance. Members of Google’s Associate Product Manager program visit the Port to gain exposure to industries outside of their day-to-day work. Port employees Brian Cox (left), Lisa Braud (right) and Alex Hernandez (not pictured) spoke with the group. R I VER REGIO N E C ONOM I C D E V E LOP ME N T I N I TI ATI VE BRE A KFA ST I N WA SHI N G TON , D . C.
Over 200 Louisiana lawmakers, businessmen, industry executives, parish leaders and economic developers attended the annual breakfast meeting held in Washington, D.C., hosted by the Port and the parishes of St. Charles, St. John the Baptist and St. James. Paul Aucoin emceed the event. Standing – Governor John Bel Edwards and Paul Aucoin Sitting (L-R) – Commissioner Joey Murray, Commission President Paul Robichaux, Michelle Citron of Dynamic Industries, Marissa Lingoni of Providence Engineering, and John Ducrest, Commissioner of Louisiana Office of Financial Institutions. Plains Marketing L.P. a d d re s s : 6410 Plains Terminal Road, St. James, La. 70086 t e rmi na l ma nag e r: Craig Ellinwood ph o ne : 225-265-2353 fa x : 225-265-3171 we b: PAALP.com lo cat i o n: Mile marker 158.6 f u nct i o n: Storage of petroleum products. MPLX L.P. (Pin Oak Terminals) a d d re s s : 4006 Highway 44 Mt. Airy, La. 70076 co ntact: Gregg Qualls ph o ne : 504-533-8783 we b: PinOakTerminals.com lo cat i o n: Mile marker 144.1 f u nct i o n: Storage of petroleum products. PSL Westbank St. James co ntact: Paul Aucoin ph o ne : (985) 652-9278 Property acquired for development. On the bank of the Mississippi River at mile marker 137 just before the high water season began.